Investors are putting short-term rewards ahead of the long-term health of the planet. The International Energy Agency estimates that another $10.5 trillion will need to be invested in clean energy by 2030 to avoid raising the planet’s temperature by more than 2 degrees Celsius. If warming exceeds that level — or even if it falls short — it could have catastrophic, irreversible effects. Financing for fossil fuels snapped back sharply after the financial crisis. Financing for renewable energy, on the other hand, still hasn’t returned to its pre-crisis 2007 peak. On Monday, thousands of protesters marched through lower Manhattan to call attention to Wall Street’s role in causing global climate change. They weren’t wrong to do so. Financial markets are failing to put enough funding into renewable energy. At the same time, they continue to invest hundreds of billions of dollars in fossil fuels. The chart below, using data provided by Bloomberg New Energy Finance, shows the gulf between the money raised by oil, gas and coal companies and the money raised by renewable energy companies over the past decade. 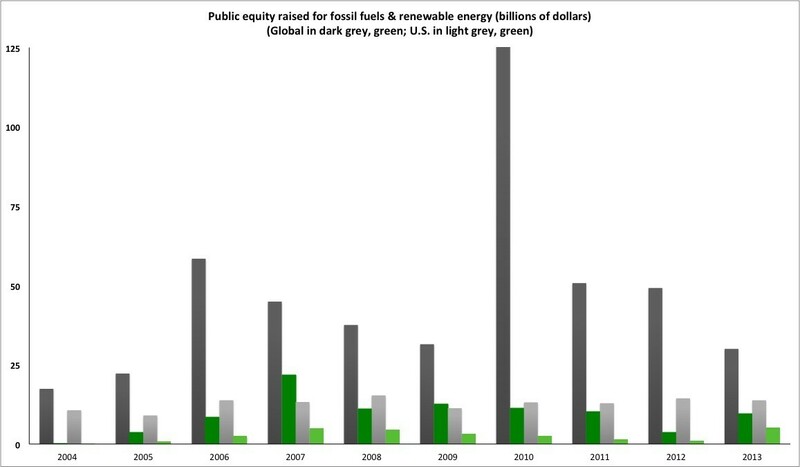 Public equity investment in renewable energy is dwarfed by investment in fossil fuels. What this chart shows is short-term market efficiency and long-term irrationality caused by political and regulatory failure. Put another way: Investors are putting short-term rewards ahead of the long-term health of the planet. The International Energy Agency estimates that another $10.5 trillion will need to be invested in clean energy by 2030 to avoid raising the planet’s temperature by more than 2 degrees Celsius. If warming exceeds that level — or even if it falls short — it could have catastrophic, irreversible effects. That dollar figure includes investments not captured in the chart, but the point is clear: We are nowhere near where we need to be. And the trend of under-investment in green energy is remarkably consistent, holding strong through the latest cycle of economic boom, crash and recovery. Even the variations within the overall trend are worrying. Financing for fossil fuels snapped back sharply after the financial crisis. Financing for renewable energy, on the other hand, still hasn’t returned to its pre-crisis 2007 peak. Investors seek return, and fossil fuels are still a massively larger and more liquid market with reliably higher risk-adjusted returns than renewable energy. One approach to narrowing this gap between the public good and market behavior is for institutions and wealthy individuals to pledge to sell any fossil-fuel assets they own. There’s a well-publicized fossil-fuel divestment campaign that has so far gotten pledges from institutions and individuals with more than $50 billion in assets. These parties have promised to sell their fossil-fuel holdings over a five-year period and invest the proceeds in renewable energy companies. The $860 million Rockefeller Brothers Fund — launched with money from a fortune built by Standard Oil —recently became the latest, and most symbolic, member of the divestment campaign. Unfortunately, that campaign is much smaller than it seems, and it will do little to correct the imbalances in global energy investment. That $50 billion figure refers to the total assets of the participating investors, not the assets they’ve pledged to sell. It’s unclear exactly how much in fossil-fuel assets these investors hold, but you can get a rough idea by using the S&P 500 (currently 10.7 percent energy stocks) and energy as a percent of GDP (about 8.5 percent). At a guess, then, the divestment movement might represent somewhere between $4 billion and $5.5 billion in energy assets. Spread over the course of five years, that won’t actually do much to boost renewable energy investment. And as Daniel Gross points out at Slate, it’s not as though selling one’s stock in an massive oil company does that company a lot of harm. Exxon alone has a market value of more than $400 billion. Most people still buy gas. And every share a divestor sells is a share someone else buys. The divestment campaign is in a perverse numerical situation. Ultimately, $5 billion over five years is a tiny amount, relative to fossil-fuel investment. But if you actually tried to close this gap, which reached $376 billion over the past decade, you wouldn’t be able to find enough renewable energy companies or conservation projects to productively put that money to use. There are, of course, plenty of fossil fuel assets to buy. Matt Frost, who used to work in the coal industry and is now a federal contractor with clients at the Environmental Protection Agency, thinks that a solution might lie with the abundance of dirty energy assets ready to be purchased. His idea, dubbed the “coal retirement plan,” is simple: Instead of selling coal reserves, buy them. And then don’t mine them. Just leave the coal in the ground. The reason this could work is that even if a coal company owns coal directly beneath its land, it might need to use adjoining land to drill shafts to get to that coal. Geologists and engineers who wanted to help you stop these coal companies from accessing their coal could identify reserves that could be trapped this way, and tell you what land you’d need to buy to keep coal companies from getting at it. Think of it as an inverse of the milkshake strategy from “There Will Be Blood”: Rather than a rival drilling from his land to access your below-ground assets, you keep the rival from drilling on your land to access his below-ground assets. The goal, according to Frost, is to drive up the price not just of burning coal in the U.S., but of buying coal in the first place. That strategy is not going to prevent climate change on its own. But it would do a lot more than investing another billion dollars a year in renewable energy.